As in other recent Pew Global Attitudes surveys, this year’s survey finds only limited support for terrorism among Muslim publics. 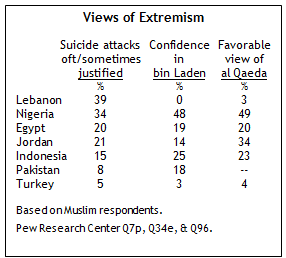 There is no country in which a majority of Muslims endorse suicide bombing, voice confidence in Osama bin Laden, or express a favorable view of al Qaeda. Still, a significant number of Muslims in some countries do embrace these positions. This is particularly true in Nigeria, where nearly half express confidence in bin Laden and offer a positive opinion of al Qaeda, and about a third say suicide attacks are at least sometimes justifiable. 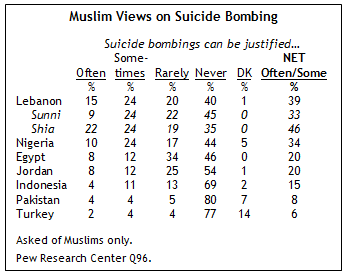 Support for suicide bombing is even higher in Lebanon, although virtually no Lebanese Muslims express a positive view of bin Laden or the organization he leads. Meanwhile, in Turkey across all three measures there is almost no support for extremism. Overall, support for suicide bombing is much lower now among Muslim publics than it was in the middle of the last decade, although there have been slight increases this year in Jordan and Egypt. And, as in previous years, publics in countries with largely Muslim populations continue to be concerned about the rise of Islamic extremism, both in their countries and around the world. types of attacks is considerably lower in Lebanon than it was in 2002, when 74% of Muslims said they were often or sometimes justifiable. About one-third (34%) of Nigerian Muslims believe this kind of violence can be justified. While this is a relatively high number, it nonetheless represents a decline from last year, when 43% held this view. One-in-five Egyptian and Jordanian Muslims endorse attacks on civilian targets, and in both countries support is up slightly, rising by eight percentage points in Jordan and five points in Egypt. Still, Jordanian Muslims are much less likely to support attacks on civilians today than five years ago, when 57% held this position. 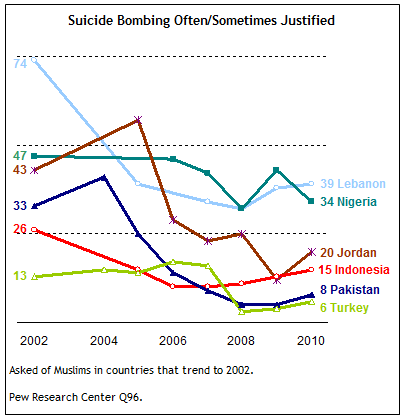 Support for suicide bombing is relatively low in Indonesia, as well as in Pakistan and Turkey, where fewer then one-in-ten say it can be justified. Indeed, in these three nations more than two-thirds say this type of violence can never be justified in the defense of Islam. In Indonesia and Turkey, support has been consistently low over time, however in Pakistan, as recently as 2004, 41% of Muslims thought that violence against civilian targets could be justified. As with suicide bombing, support for Osama bin Laden had declined in recent years, and on balance, it is down again this year. Looking at the seven Muslim publics surveyed, the percentage who have confidence in bin Laden to do the right thing in world affairs has decreased since 2009 in four nations, while remaining about the same in three. By a wide margin, Nigerian Muslims express the most positive views of bin Laden, with nearly half (48%) saying they have confidence in the al Qaeda leader, although this is nonetheless a drop of six percentage points from last year’s survey. Among Indonesian Muslims 25% express confidence, unchanged from last year, although this is considerably lower than in 2003, when 59% held this view. Support for bin Laden has also declined over time in Pakistan, where many believe the terrorist leader is hiding. Only 18% of Pakistani Muslims currently voice confidence in him, unchanged from last year, but down sharply from 52% in 2005. Just 19% of Egyptian Muslims currently express a positive view, down slightly from 23% last year. The largest decline over the past year has taken place in Jordan, where confidence in bin Laden has slipped from 28% to 14%. 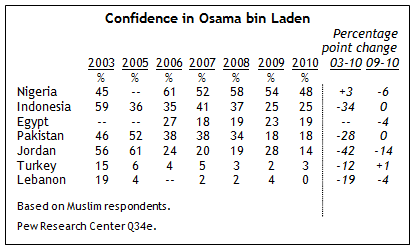 In 2005, at the height of bin Laden’s popularity in Jordan, 61% said they had confidence in him. Only 3% of Turkish Muslims and less than 1% of Lebanese Muslims voice confidence in bin Laden. When it comes to the organization that bin Laden heads, Nigerians again stand apart from the other Muslim publics surveyed – roughly half (49%) of Nigerian Muslims have a favorable opinion of al Qaeda, while 34% have an unfavorable opinion. Elsewhere, most Muslims express a negative view of the organization, although significant minorities do have a positive opinion in Jordan (34%), Indonesia (23%) and Egypt (20%). Favorable ratings for al Qaeda are rare in Turkey (4%) and Lebanon (3%). In fact, nearly all Lebanese Muslims (94%) reject al Qaeda, including 95% of Shia and 93% of Sunnis. Islamic extremism continues to be a serious concern in nations with substantial Muslim populations. In the seven nations surveyed where roughly half or more of the population is Muslim, large majorities in six say they are very or somewhat concerned about the rise of Islamic extremism around the world. The only outlier is Turkey, where 39% are concerned. Many are also worried about the rise of Islamic extremism within the survey countries themselves. Eight-in-ten are very or somewhat concerned in Lebanon, including 90% of Christians, 82% of Shia and 67% of Sunnis. Roughly three-in-four Nigerians (76%) are concerned about Islamic extremism in their country, including 83% of Muslims and 68% of Christians. Nearly two-thirds of Pakistanis (65%) also express this view, although fears have actually declined since last year, when 79% said they were concerned. Slightly smaller majorities express concern about the rise of Islamic extremism in Egypt (61%) and Indonesia (59%), as do more than four-in-ten in Jordan (44%) and Turkey (43%).